We’ve been asked a few times jokingly, or maybe not jokingly, do we do anything else besides spearfishing and snorkling. We do….when we can’t spearfish and snorkle, of course! The weather has given us reason to find other activities for the past week, pushing two now. It’s been brisk, but more than that, it’s been oddly out of the west and southwest and west and southwest protected anchorages are few here in the northern Abacos so we spent another several days in Green Turtle as it was forcasted to have squalls with 50 knots of wind. Though there was nothing really big, it kept us on the boat because even though we were anchored well, many boats around us weren’t. I think we spent hours just watching people drag and reanchor. Some gave up and thankfully picked up moorings far, far away from us. One poor guy chased his dragging boat across the harbour in his row boat, others were able to help out his boat and no damage done. It provides entertainment as long as no one is upwind of you, then it’s a whole different story! No wonder we haven’t missed TV at all. We also played a game that very closely resembles a Chinese fire drill; a rain cloud approaches, you scramble around deck closing all the hatches and zipping up all the curtains, taking down the laundry, and setting up the rain catcher. The for mentioned rain cloud then spits on you for a few minutes, just long enough to get everything damp, but not long enough to catch any water, and then moves along its merry way to dump it’s precious rain on someone else. You then scramble around deck opening up the hatches, unzipping the curtains, hanging back up the laundry, and closing up the raincatcher before you swelter. We played this game a lot. 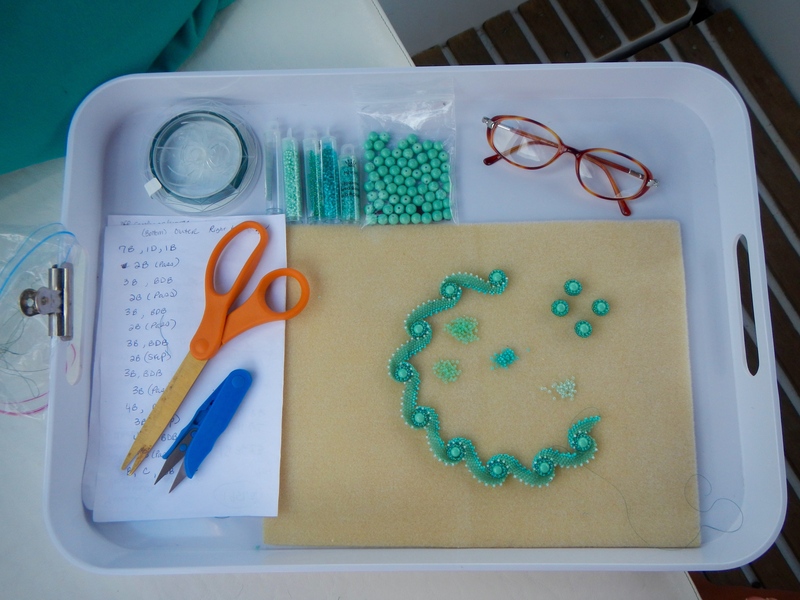 Besides boat and rain cloud watching, Keith puttered around in the dinghy and chatted with the other cruisers and I finally dug into my bead locker and worked on a few beadwork projects. I was quite content having a “rainy day week”. Two days ago we finally moved along back to Crab and Allens-Pensacola thinking the weather had broken even though it’s still out of the southwest, it was doable. We did get in two good dives yesterday, we got hogfish for dinner but we kept the dives a bit short, it was choppy and had poor visibility. On the dinghy ride back to the boat we saw a 10 foot hammerhead shark swimming through one of the very shallow cuts. We are pretty sure of the length because we drove the dinghy over him when he got in the deeper water and our dinghy is 10″2′. I’m so glad we didn’t meet him in the water. Keith got in just yards away to pick up some conch, I didn’t get back in the water. I know they are always there, every dive, it’s just different when you see them. I did notice he stayed pretty close to the dinghy though! 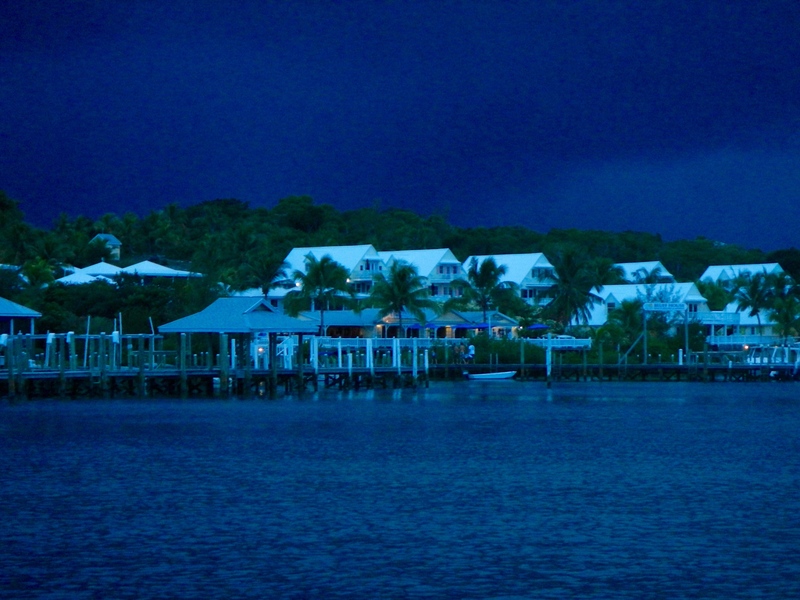 Dinner was delicious because hogfish and conch always are, which was good because the rest of the night was a windy bouncy noisy sleepless experience. 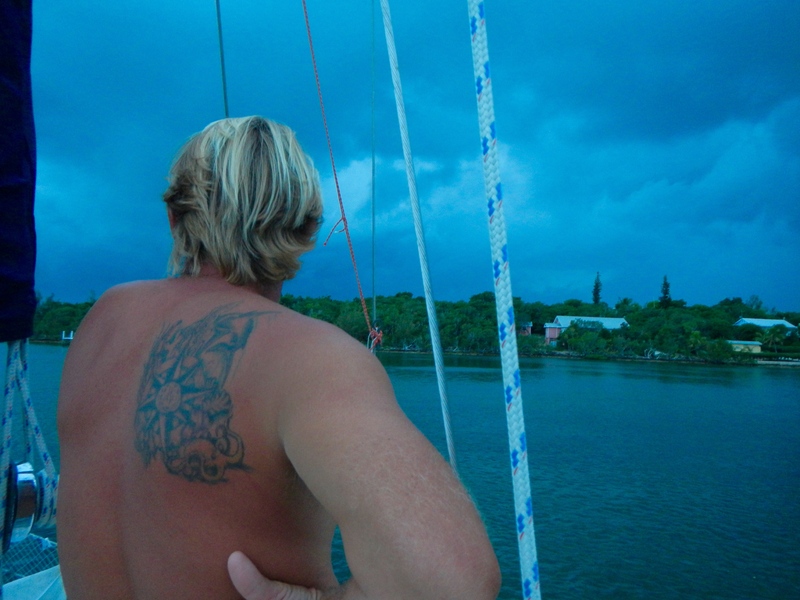 The wind picked up more than expected and the anchorage is not sufficiently protected. We decided to move along today back to Crab Cay, which is only mildly more protected, but still more. That, and three big power boats with three little anchors came in and anchored around us. We recognized the one as being one of the draggy boats from Green Turtle and the other had such a tinsey little Bruce anchor dropped on top of the grassy bottom that we had no faith in his ability to stay in one place, so outta there we got. Of course the winds clocked to the northwest after getting here which is completely wide open and it was blowing into the lower 20s and gustier. (Note: SO not in the forcast!) We were eating dinner in the cockpit and Keith said in all honesty “I could surf those waves!” in a kind of excited way. We had to laugh realizing that is probably not a comment you want to make about the conditions in your anchorage. Kai liked the breaking waves much less and barked at them, I really couldn’t fault him, I didn’t like them either and it wasn’t like there was another boat in the anchorage for him to disrupt. For now the winds have shifted back and dropped down and we have no boats to worry about dragging into us so I am expecting a good nights sleep- or at least until 6:30 am because that is the unholy hour the weather is broadcast. Hey guys it looks like your racking up some great memories. Very jealous over here on the the mainland. David-yep, we are having a good time and making good memories. I’ll be stopping by work soon, see you then. We had our great dragging anchor debacle in Green Turtle. After 3 days of endless squally night anchor watches we thought we were safe. We were wrong! We feel you, there were plenty of boats having a hard time staying put there. We had found a good sandy hole and stuck in pretty good thankfully.